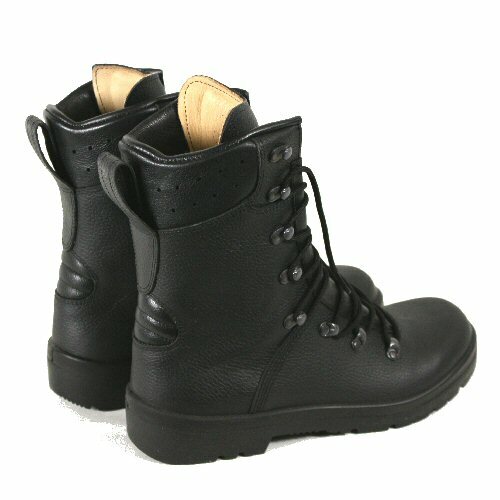 Genuine German Army all leather, high leg, leather, lace-up combat boots in unissued or near unissued condition. May have slight creases on the leather, and soles are almost unmarked. Model 2007 soles are directly moulded to the boot, and the rubber is contiguous, unlike the earlier foam-rubber layer that can be susceptible to layer fatigue. Made in high grade leather, they are fully lined internally with leather. The sole is oil and nitrite resistant, with the dynamic sole pattern featured in the earlier models. The boots feature a speed lace system, cushioned collar and tongue, and high baffle. Water barrier layer makes the boots are highly water resistant. Soles are internally reinforced with a steel plate underneath for maximum stability in uneven terrain. The rear of the ankle has a compression slot cut in to aid movement. A loop is also provided to make putting on the boots quicker. Black leather, and while stocks last. 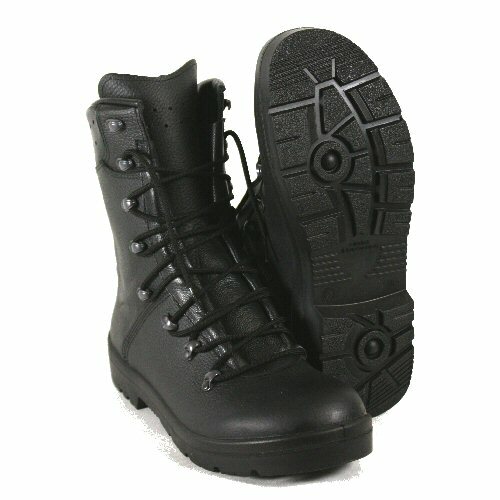 Highly stable and tough outdoor boot, ideal for work, off track walking and outdoor leisure. Available options are: 42UK8 , 44UK10.5 . The rear of the boots and a closer view of the lacing system.